WaterSim Phoenix estimates water supply and demand for the Phoenix Metropolitan Area. 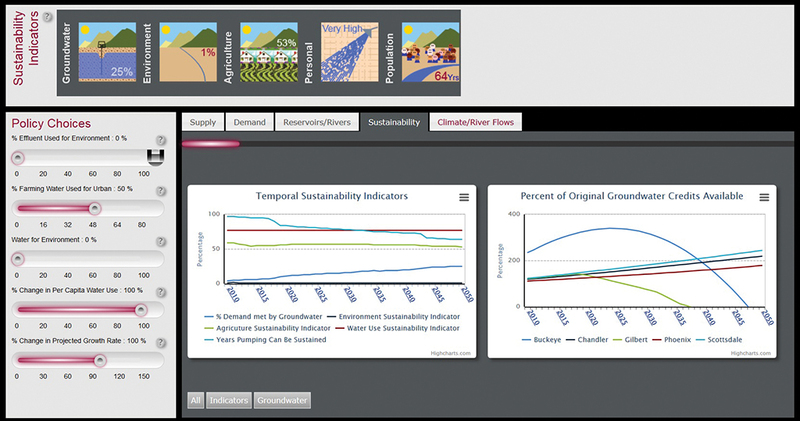 Users can explore how water sustainability is influenced by various scenarios of regional growth, drought, climate change impacts and water management policies. 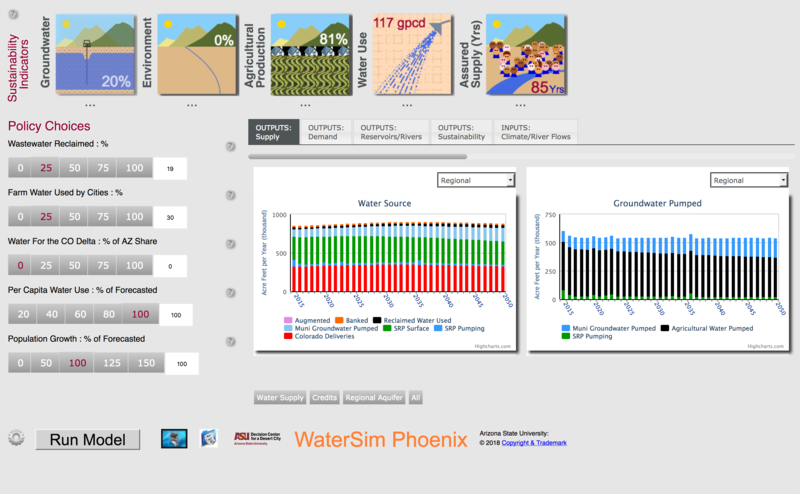 WaterSim Arizona is a web browser-based user interface to a water balance model that mimics the water supply and water use dynamics for five distinct regions of the state of Arizona. WaterSim America explores water issues on a state level as an exhibit within Smithsonian’s Museum on Main Street Water/Ways exhibition. Central Arizona is facing a water crisis, but not one of water shortage. Because the past century of leadership planned its water supplies to meet growing demands, Central Arizona has enough water to meet current and near-future needs. In the 21st century, Arizona faces new challenges, including long-term drought, climate change impacts and austere public finances. These challenges require new approaches to water sustainability that focus on choices, priorities and smart investments. The fundamental issue is how we will choose to use our available water to sustain our economy, quality of life and natural environment. 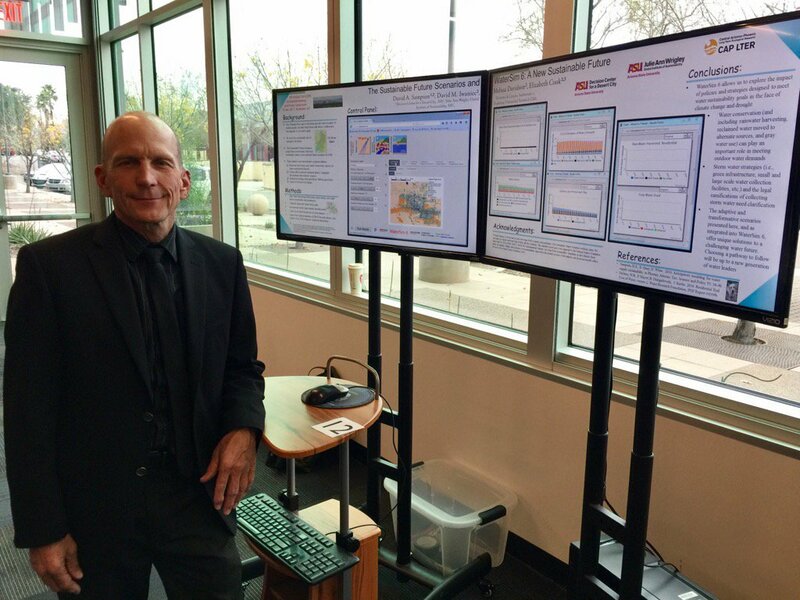 Arizona State University created the WaterSim model to estimate water supply and demand for the Phoenix Metropolitan Area. 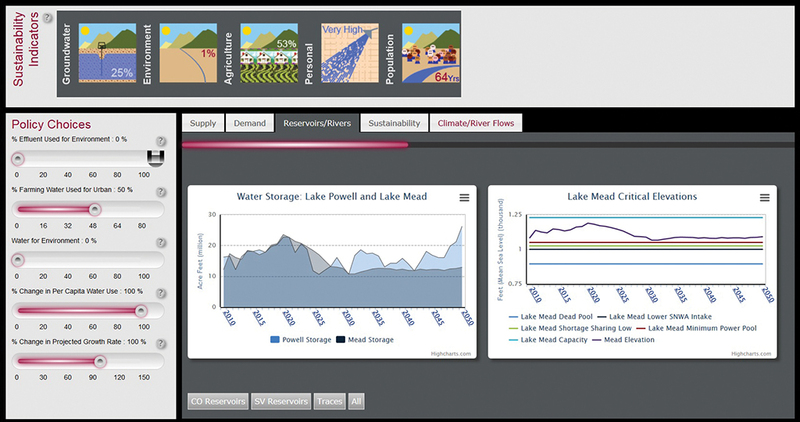 Users can explore how water sustainability is influenced by various scenarios of regional growth, drought, climate change impacts and water management policies. WaterSim is a systems dynamics model. It is a “systems” model because it takes a lot of data that is usually collected separately – including water supply, water demand, climate, population and policy data – and puts it together to give the user a system-level view of how these variables interact. It is “dynamic” because users can change one variable and see how that change affects the other variables. WaterSim is a visualization tool. Rather than poring over pages upon pages of charts and tables, users can view the data in graphic form. They can make side-by-side comparisons to understand how one variable relates to another. 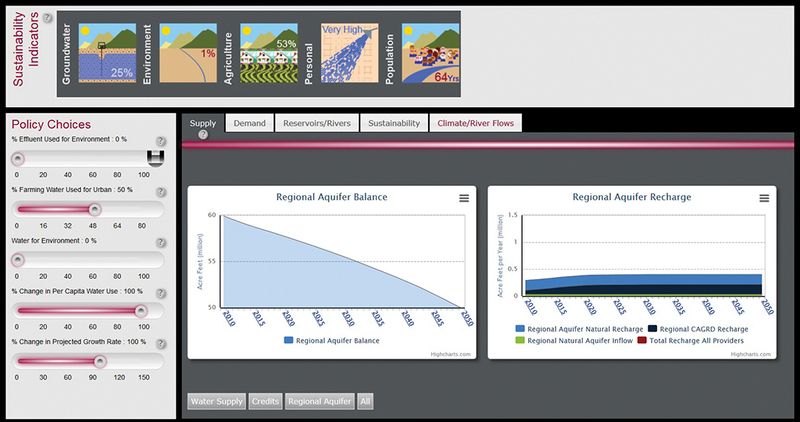 Launched in 2007, WaterSim is now in its fifth iteration, and can be viewed online, through a web API, or in person at ASU’s Decision Theater. WaterSim allows users to change variables one-by-one, and then see how each change affects the water sustainability of the region and its various communities. By understanding best- and worst-case climate scenarios and the influence of various policy options on water supply and demand, decision makers can make choices informed by the best science available. Water Supply – How much water is available, and where does it come from? The Phoenix Metropolitan Area receives its water from many sources including river water, groundwater and water reuse. Water supply is primarily influenced by climate. Water Demand – Which communities use the most water per person? How much will those communities grow? Does that community have agriculture? How efficiently is water used? Water demand is primarily influenced by policy and population growth. Climate Change – We cannot predict exactly how climate will affect water supply and demand in the future. What we can do is look at past patterns – decades with high flows, low flows or high variability from year to year – to understand best- and worst-case scenarios. Population Growth – The population of Great Phoenix has been steadily growing for decades. Will it continue to grow at this pace, or will it grow faster or slower than predicted? WaterSim users can create best- and worst-case scenarios by changing this variable. Policy Decisions – Who gets to use the water that is available? Individuals, businesses, farmers and ecosystems all require water, and some water must be stored for future use, as well. WaterSim users can manipulate allocation of water for these various uses.